VacciCheck, one in-clinic kit, checks protection from CDV, CAV and CPV. TiterCHEK by Zoetis measures protection against canine distemper and parvovirus. Both are ELISA-based systems well validated against the ‘gold standard’ VN and HAI tests. Read more about the opinions of Drs. Day and Schultz on the Vaccichek site. It’s often easier to find someone who already believes as you do than it is to attempt to change a mind cast in concrete. 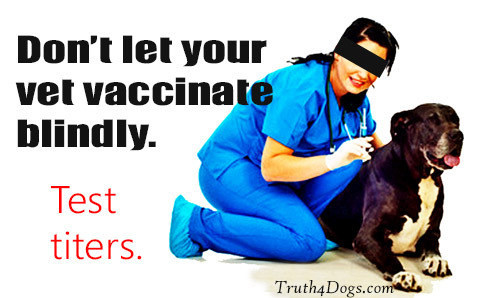 This is especially true when dealing with a vet, like Ann’s, who has a vested interest in continuing to give injections, or who denies that vaccines can cause bad reactions. Such a vet is probably behind the times, or lacking in education, in other ways as well. Of course, sometimes finding a new vet is not practical. Maybe your vet is the only one within miles, or is charming or is married to your baby brother. To bring this vet (or Ann’s) kicking and screaming into the 21st Century, you’ll need information from unimpeachable sources. I wrote an article called Titer Testing: A Crash Course for a lay audience. (If you’d like to know more about when, how and how often to test, check it out.) I got the impression, however, that it might not seem scientific enough for Ann’s purposes. Bummer. 1. If you suspect your vet doesn’t understand testing or trust test results, have him/her read the roundtable discussion of noted experts, moderated by Dr. Shultz, talking about titer testing. Other veterinarians at the table (who are also Internal Medicine diplomates) are Richard B. Ford, Jory Olsen and Fred Scott. Starting on page six, they discuss titer testing at length and how to interpret results. 2. If you are confrontation averse, try saying something like: “Bailey felt horrible after his last shots. Let’s do the titer test today and I’ll come back soon to discuss vaccinating. I just want to see the test results first.” If the vet still pressures you to vaccinate, try: “I know you don’t believe in titer testing, and I appreciate your advice. I’ll have someone else draw the blood and send it in. We can talk when I have the results.” Smile politely. 3. Gently expose any hypocrisy. Vets are vaccinated against rabies in vet school. Thereafter, they have their own titers measured periodically to determine when they should revaccinate. The US Center for Disease Control says: “A rabies antibody titer is essentially an estimation of an immune response against rabies virus (either through exposure or vaccination)…. Typically, rabies virus neutralizing antibody tests [titer tests], such as the rapid fluorescent focus inhibition test, are used to monitor antibody levels in persons that may have an occupational risk of rabies virus exposure (e.g. veterinarians, rabies virus laboratory workers, etc.). 4. Send your vet this video by Ron Schultz, PhD. On this same webpage, there’s an excellent four-part video series in which Karen Becker, DVM, interviews Dr. Schultz. 5. Titers prove immunity for exporting pets abroad and to Hawaii. In addition, standards for parvovirus and distemper are widely accepted worldwide. Prestigious institutions like Kansas State University Rabies Laboratory do rabies titer testing. (Currently, vets use the titer standard for humans for dogs.) Drs. 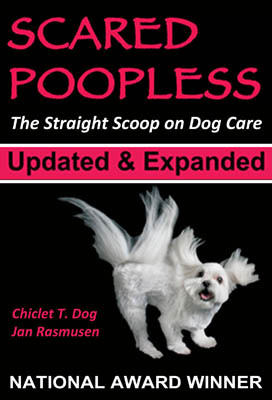 Schultz and Dodds, principals of the RabiesChallengeFund, are working to prove a rabies titer standard for dogs. The University of Wisconsin at Madison is donating their facility for the research. Ask your vet why these institutions, and countless others, would recommend titer testing if it is bad science? Would any of this information convince Ann’s vet (or yours) to reconsider his position on testing? I hope it does. The health of her dog, and yours, may be at stake. I am concerned about the first three year rabies shot for my new dog, a tiny Chihuahua. My previous being dog, a five pound toy poodle, was having problems from a collapsing trachea and was 13 years old. I asked the vet if she would giving me a waiver letter, but she declined. She manipulated me into believing that this was needed. My little dog was the love of my life. He died the following year out of suffocation from his condition. It was hell to watch. He had problems with his bronchi also and who knows about the heart as the collapsing trachea condition leads to other complications. I hated myself to have listened to her. My dog was always in my arms under my shawl, no front teeth, no wildlife in the area. I have 6 dogs (3 german shepherds and 3 goldendoodles) I have stumbled across your website and I am definitely wondering what poisons I have been putting into my dogs’ bodies. They are all healthy and have had no major issues. We live on a mountain in NC that has wild coyotes, raccoons, deer, mountain lions and other animals. We also have a pond on our property. From this information do you believe I need to get the Lepto virus shot? My vet recommends it, but to be honest I don’t truly trust his opinion anymore. Also, what type of food would you feed? I am looking into a raw diet, but are there any “dog foods” that could be trusted? What type of raw diet would you go with for these dogs, do the shepherds need a different diet than the golden doodles? Anita, the monthly chews contain medication that is causing resistance. The American Veterinary Medical Association says: “genetic change in heartworms is related to resistance to preventive drugs.” I imagine, but don’t know for sure, that it’s the new push to give meds year round, even when they are not necessary in cooler locales. Read this: genetic change in heartworms is related to resistance to preventive drugs. Please see the lists at http://www.truth4pets.org for a holistic or homeopathic vet. But know that any vet should draw blood for your dog and send it, or you can send it.